Brian Klaus, an artist in his own right, is very particular about his photographic work. He critically examines everything from the proper lighting needed to photograph the nail to the quality of the nail art design. When it comes to shooting nail art, professional photographer Brian Klaus doesn’t just focus on the design itself, he consider the whole picture. “I try to come up with backgrounds and props that will go with the nail art,” says Klaus. 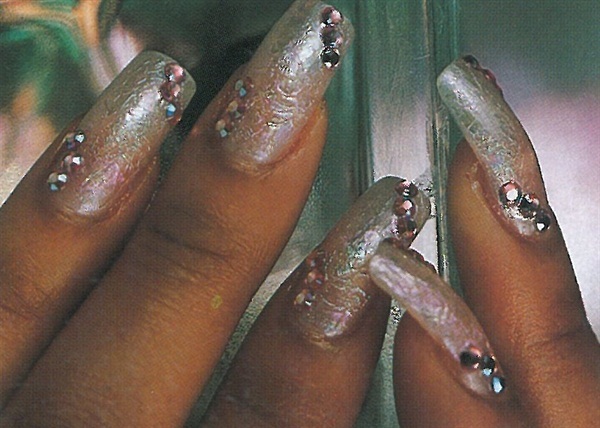 If the nail art has subtle colors, Klaus advise using a background that complements rather than overpowers the nail art. “The eye tends to be easily distracted, so I use more subtle colors with a softer focus in the background, “he say. Klaus, an artist in his own right, is very particular about his photographic work. He critically examines everything from the proper lighting needed to photograph the nail to the quality of the nail art design. “You don’t want to over or under expose a picture, “he explains. “If you have a floral design with a bright light reflecting off nail, you won’t be able to see the petals.” You need to use softer lighting that will make the details of the design easier to see, he advises. It’s also important to magnify the nails with special lens to make them stand out, Klaus continues. “If you have a hand holding glass, you don’t have to show the whole glass,” he explains. Since the detail of the nail is very small, it’s best to get a close up of the nails and leave out a part of the glass. The final photo depends on the input of the nail technician. She is not only needed to assist with background colors and props, she’s responsible for the presentation of the nail art. Getting a model with good hands is also important, he says. “Her hands should have a nice, slender shape.